Hidden from the usual beach routes is Costa De Oro. 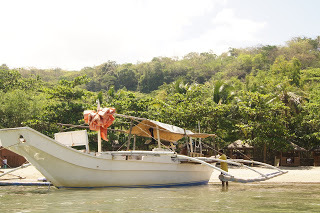 Located in Barangay Natipuan, Nasugbu, Batangas, this once private resort is not accessible by land but by a 20-30 minute banca ride. 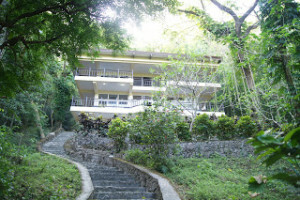 It’s the same area where the rich and famous have their rest houses in this part of Batangas. The houses dot the coastline and beside the hilly areas of the island. You would also notice that the more affluent have their yachts parked on the shore. It didn’t appear in any Internet searches and was believed to be known only to locals and foreigners (mostly Japanese). However, club members of Terraza can gain access to it via a 5-minute walk from the beach, and those from far away Munting Buhangin can walk the beach in about 15 minutes. Otherwise, it’s faster and more enjoyable to reach the place via banca ride if you come from other parts of the island. 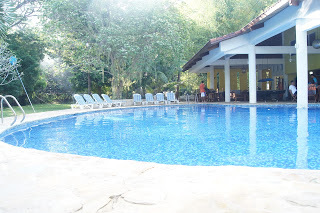 Owned by a British couple (the wife is Pinay), Costa De Oro is well maintained and has the luxurious feel of a private resort with its own swimming pool and covered by forest. During the day, you’d hear different calls of birds — reminiscent of the Mocking Jays in Hunger Games. At night, you’d hear the sound of Geckos (local: Tuko). The airconditioned rooms are large enough to accommodate as much as 7 people. 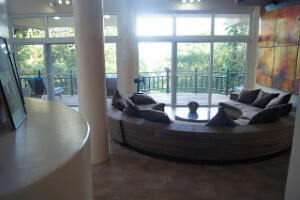 There’s a spacious kitchen, dining, and living area in the main villa where we stayed. To get to the main villa, you’d have to walk a 3 flights of cobbled-stone stairs. Since there was a huge lanai (by the pool), we would bring our things for the day and just hangout by the pool. The beach is a few meters away. In the main pool area and lanai, you can either buy fresh seafood to be cooked by Chef Baggy — a veteran cook and chef from the old Anito and Victoria lodges. 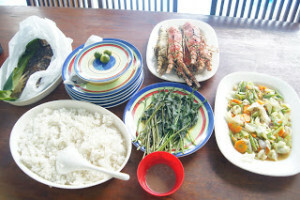 Thus, we bought fresh lobsters and tuna from fisherfolk, had them grilled also by them, then order the rest from Chef Baggy. I even ordered fresh Talbos ng Kamote (Camote Tops) which he picked from the garden! During the day, local banceros can take you on a boat ride towards the whole island, even as far as Fortune Island and Twin Island. From across Costa De Oro, you can see exclusive summer dwellings of the titled few and see their parked yachts and sailboats. It is said that the island hosts the likes of Aga Muhlach, Rica Peralejo, The Marcoses and even FVR. Willie Revillame’s yacht is also seen docked across Costa De Oro. For 2 days, inclusive of all the frills, fresh bounty and banca ride, it only cost us less than P20,000! There were 5 of us. Not bad, eh? Getting there is via Nasugbu route (Town proper), then park your car c/o Aling Ana’s residence. Only personal referrals allowed by her. You need a banca to get to the island. Stay away from peddlers if you want to make the most out of your money. Previous articleSummer Road Trip? Remember this: B-L-O-W B-A-G!